^ a b c Robert E. Buswell Jr.; Donald S. Lopez Jr. (2013). The Princeton Dictionary of Buddhism. Princeton University Press. pp. 546, 59, 68. ISBN 978-1-4008-4805-8. https://books.google.com/books?id=DXN2AAAAQBAJ. ^ Thomas William Rhys Davids; William Stede (1921). Pali-English Dictionary. Motilal Banarsidass. p. 543. ISBN 978-81-208-1144-7. https://books.google.com/books?id=0Guw2CnxiucC&pg=PA543. ^ Damien Keown (2004). A Dictionary of Buddhism. Oxford University Press. pp. 8, 47, 143. ISBN 978-0-19-157917-2. https://books.google.com/books?id=985a1M7L1NcC. ^ David Webster (2005). The Philosophy of Desire in the Buddhist Pali Canon. Routledge. pp. 100–105, 177, 236. ISBN 978-0-415-34652-8. https://books.google.com/books?id=GLPGFoLED7sC. ^ David Loy (2003). 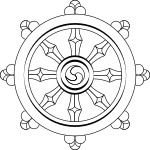 The Great Awakening: A Buddhist Social Theory. Simon and Schuster. pp. 28. ISBN 978-0-86171-366-0. https://books.google.com/books?id=mwF6-sgB-UkC.